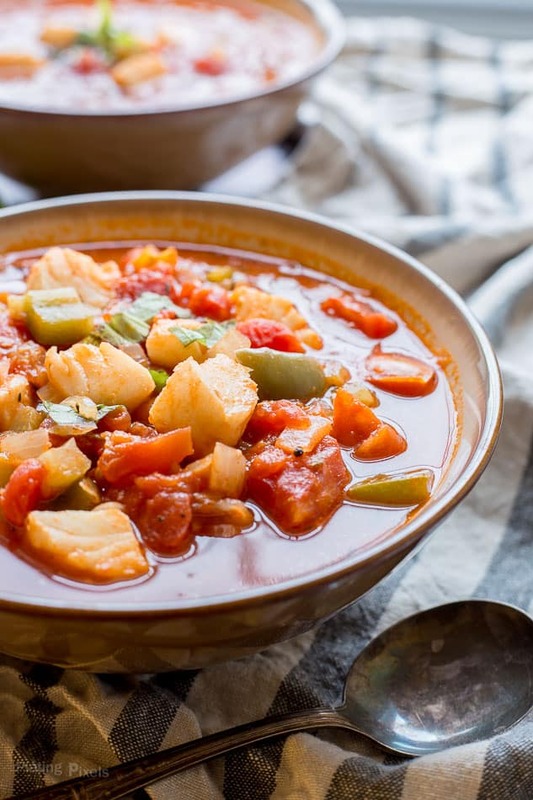 Quick and healthy One Pot Cod Fish Soup is perfect for cold weather and ready within 30 minutes. 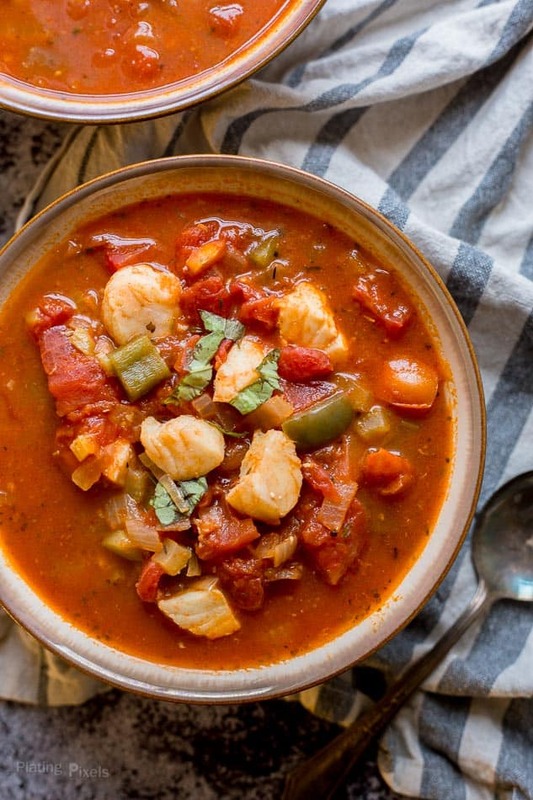 Easy fish soup recipe with tomato, onion, bell pepper, garlic and cod whitefish. It’s cozy, comforting and something the whole family will love. If the view outside is any indication, I’d say it’s soup weather. With colder weather, you’ll want cozy, comfort foods. 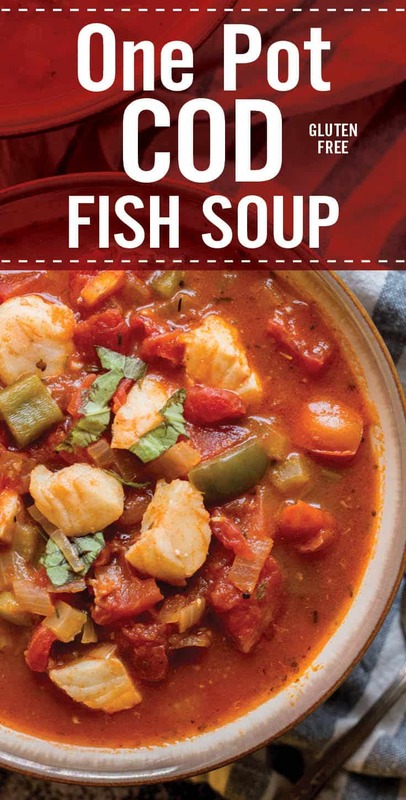 Wholesome, heart-warming recipes like this Italian Cod Fish Soup have lately been a favorite of mine. It’s cooked in one pot and loaded with clean-eating ingredients such as veggies, with rich flavor and lean protein from fish. You can modify how you like by including other seafood such as shrimp, and extra vegetables. Making fish soup is as simple as assembling ingredients and cooking in one pot, all in less than 3o minutes from start to finish. Whitefish, such as cod, will cook quick right inside the broth, so no pre-cooking is needed. Less work and less clean up will allow more time for relaxing this winter. Another bonus is it’s mostly made with vegetables and fish, so it’s wholesome and gluten-free. This healthy fish soup has plenty of flavors, but still perfect for fitting into your healthy lifestyle. Alaska cod, also known as Pacific cod, is a popular whitefish variety. The moist, yet firm texture makes it a versatile fish. The distinctive flake and slightly sweet flavor adapts well to almost any cooking method. It even holds up well once cooked into this fish soup. You could also use other meaty white fish such as haddock or monkfish. If you are unable to find these fish sole or tilapia can be used, but won’t be as meaty. Cod is an ideal choice for fish soup because of its firm texture that holds up well…as you can see with the delectable chunks of fish in the photos. However, it’s still moist and flaky and has a nice mild flavor that absorbs the flavors of the broth. Note: You could also use another white fish such as sole or tilapia, but it won’t be as meaty and will likely fall apart in the soup. Do you need to pre-cook fish before adding to soup? Fish is a lean meat that cooks very quickly. You can add it straight to the warm soup at the end just before serving. An added bonus is that it soaks up the flavors while cooking. Allow about 5 minutes for it to cook through and become tender. Texture: Tender fish and veggies in a thick broth. 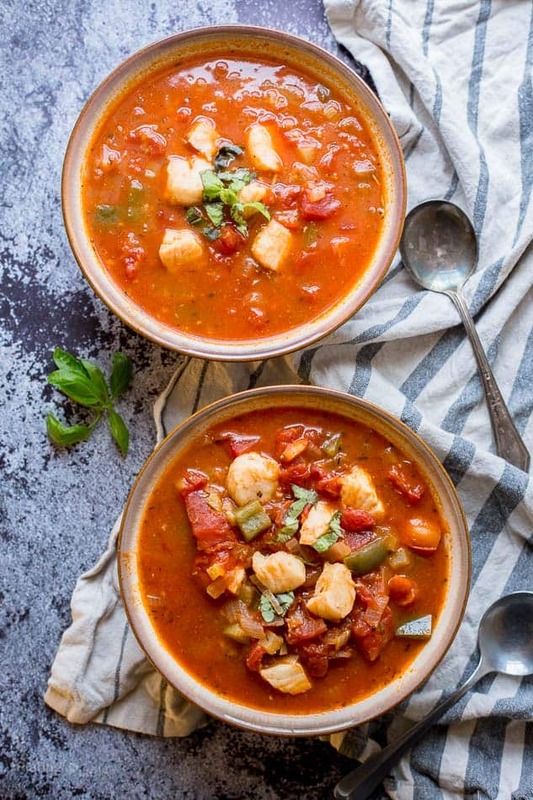 Quick and healthy One Pot Cod Fish Soup perfect for cold weather. 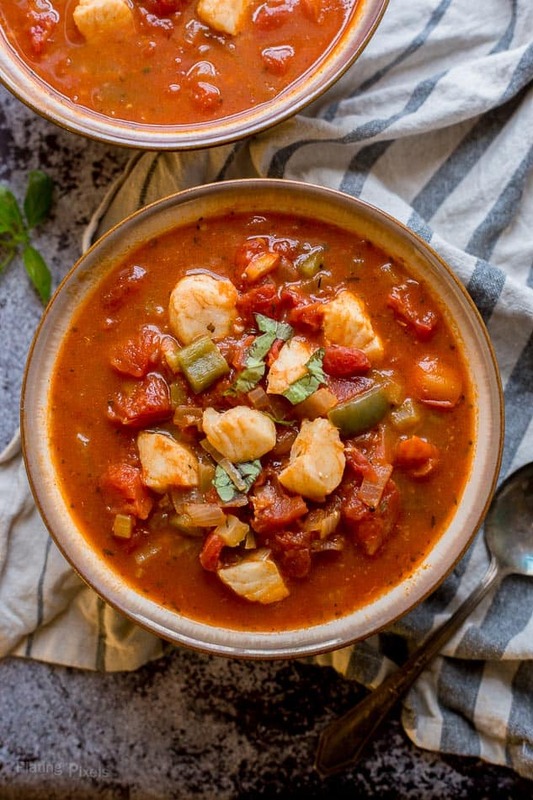 Easy winter soup with tomato, onion, bell pepper, garlic and cod whitefish. Heat olive oil in a large pot over medium-high heat. Add onion, and cook 6-8 minutes until fragrant, stirring often. Stir in garlic, celery and bell pepper. Reduce heat to medium and cook 5 minutes more. Stir in wine, lemon juice, Italian seasoning, and pepper. Cook 2-3 minutes until most of the liquid is dissolved. Stir in chicken stock, diced tomato and tomato paste. Cook 10 minutes more uncovered, or until bell peppers are just tender. 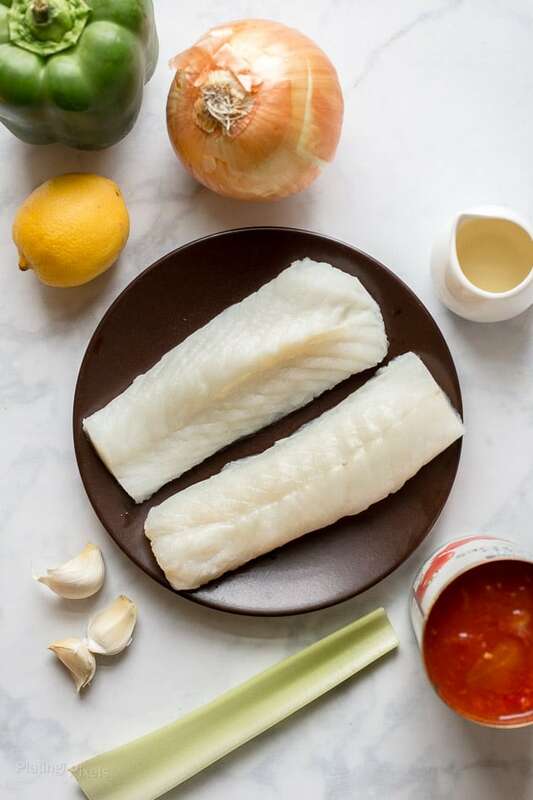 Cut cod into small, bite-size pieces. Stir into soup and cook until fish is tender and opaque, or about 5 minutes. Serve with basil as garnish. Add the fish in at the end so it doesn't overcook and break up too much. You could also use other meaty white fish such as haddock or monkfish. If you are unable to find these fish sole or tilapia can be used, but won't be as meaty and will likely break apart in the soup. Try adding some red pepper flakes for a spicy kick. If you're making this in advance don't add the fish until you reheat it and are ready to serve. This was so easy to make! I made it to take for lunch the next day while I made dinner and it turned out very tasty I added carrots and green beans to it as well to make it a little heartier being that I work a 12hr shift and it was still light and delicious!! Will definitely make it again. Just made this with my homemade chicken bone broth and it is hearty, satisfying and delicious- almost thick enough to be served over pasta if desired and covered with grated Parmesan or Romano! Just wonderful and I am keeping this recipe as a base for Italian soups. Could be done with chicken or shrimp or clams! Love it! Thank you. The homemade broth is a great idea, and I bet this soup would go well with other meats. 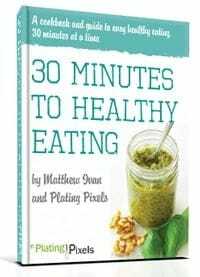 I’m so glad you loved the recipe and appreciate the wonderful feedback! Thanks! Just tried this soup with garden fresh tomatoes added chopped asparagus. The whole family loved it. A nice hunk of Italian bread perfect meal. Thanks so much for the feedback Denise and glad your family loved it! I’m a fan of asparagus so will try that next time. Wow! This one caught my eye, Matthew. Many of my favorite things, including the Pacific cod, a totally overlooked fish and so tasty and good in a dish like this. Gorgeous colors and light in the pics. Way to go! Indeed this is perfect for cooler weather. Sounds lovely with the Italian seasoning, and it’s gorgeous, too! Thanks so much Valentina! It totally is. LOVE the fact that this is a one pot dish. Makes comfort food cooking *that* much better. Looks delicious! Cod is my favorite fish and I buy it often. The dish looks so delicious and it’s definitely tasty. I haven’t really cooked with it till now but love it! Thanks Ilona. This looks so comforting! I’m all about seafood in my soups!